ESC operates on a system of continuous weekly intake, and as such, there are no terms or semesters. New students are provided with an orientation and level placement test on a Monday before entering class on a Tuesday. The academic week therefore always runs from Tuesday to Monday. 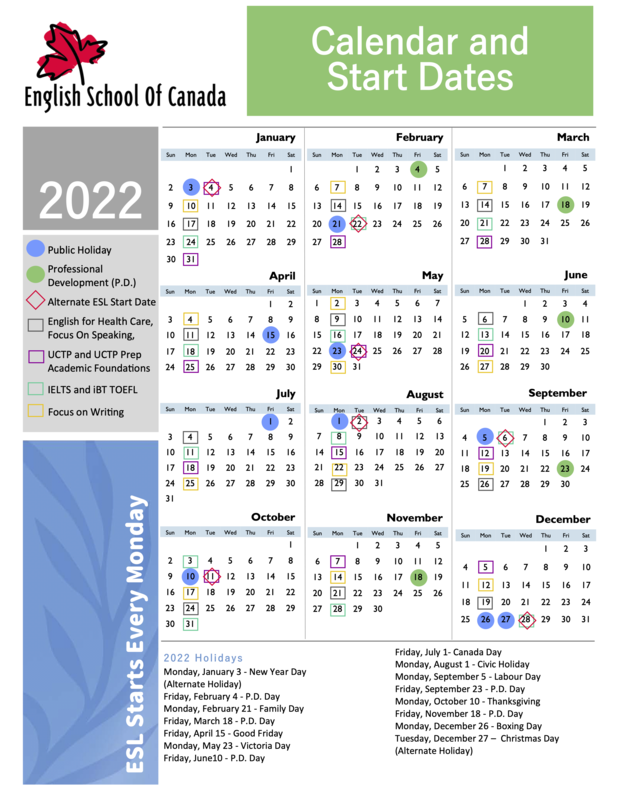 English School of Canada is committed to providing English language instruction to all students who meet the requirements for admission as outlined in the Admissions Policy. Students are not required to provide evidence of language proficiency prior to commencement of studies but are rather assessed on their language proficiency and placed in a program and/or classes of study as deemed suitable. ESL classes are available to all students at the school. Students wishing to enter ESP Programs or the University College Transfer Program (UCTP) are required to be ESC Level 7 or above, or have documented proof of a minimum IELTS score of 5.5 or iBT TOEFL score of 69. English School of Canada is an institution that provides private language instruction for English language learners. ESC does not require any assessment of academic credentials from its students, nor will academic credentials from other institutions be a factor considered in placement in ESC Programs. Agents or Individuals send ESC a signed and completed Registration Form (including Accommodation Form if needed). The form is found on the school website: http://esc-toronto.com/register or can be sent by email as an attachment. The form/forms are given to the Admissions Department. The invoice is created and sent to the agency or directly to the student. The payment for the invoice is made to ESC either by wire transfer, debit, cash or by credit card payment, in which case the Credit Card Authorization Form will be completed. Once full payment has been received, an official Letter of Acceptance will be issued upon request. The student or agency will use this letter to apply for the study permit or to show the officer at the port of entry as a proof of study. Students can only commence their program after the full fees have been received. At ESC, we are committed to providing students with clear, measurable outcomes for their language learning. Student progress at ESC is continuously evaluated using a mixture of diagnostic, summative and formative assessment. The methods of assessment should be applied equally by all instructors to each student. Assessment methods and class expectations should be clear to all students. Assessment and feedback should always be constructive. Equal attention should be paid to areas of strength as to areas needing improvement. Assessment should provide students with a feeling of pride in successfully completing desired outcomes. Students who wish to withdraw from their program of study will be allowed to do so and will be held to the regulations as outlined in the official Refund Policy. The academic week runs from Tuesday to Monday. If a student’s average attendance is below 80%, he or she may be referred to a counselor. Average attendance is recorded on class schedules and school records. If a student attends less than 80% of any class, he or she may need to stay longer in the level. Focus Programs and UCTP have different attendance rules. If a student does not follow the attendance rules for his or her program, he or she will be removed from it and must return to General ESL classes. All classes are 1 ½ hours in duration. Students who are more than 5 minutes late will not be allowed into class and will be marked as absent. Protection under the laws governing the province of Ontario. Study in an environment where health and safety regulations are adhered to. Communicate and exchange ideas freely with others. Support from ESC staff in pursuit of academic progress. Support and information regarding life in Canada. A study environment free of discrimination based on ethnicity, religion, sexuality or gender. Lodge formal complaints as outlined in the Student Complaint Procedure. Request a transcript of their studies for up to 25 years after completion of study. * English School of Canada defines intellectual property as any product of human intelligence and creation including but not limited to written works, artistic images including drawings and paintings, photographs, and musical works. English School of Canada recognizes each student’s exclusive rights to these assets and agrees that no use of such assets shall take place without prior consent. Abide by the laws governing the province of Ontario. Follow school rules as outlined in the Academic Good Standing Policies section of this document. Respect the equal rights of others regardless of ethnicity, religion, sexuality or gender. Treat school property and the property of others with respect. Behave in a way that does not harm, or threaten to harm, others either physically or mentally. Refrain from unauthorized sales of goods and services on school property. Refrain from consuming alcohol and/or cannabis in all forms on ESC premises. Refrain from consuming illegal substances in all forms on ESC premises. Refrain from attending school while intoxicated on alcohol, cannabis, or any other form of illegal substances. * Student conduct for ESC Homestay is dealt with separately in the Canada Homestay International document, Homestay Guide for International Students. ** Procedures and sanctions for Academic Dishonesty are dealt with separately under Good Standing Policies provided to all students in the UCTP Program. The violation will be brought to the attention of the Director by completion of a Student Referral Form by a staff member. The student will initially be informed of a violation by a Counsellor. They will arrange a time and date to meet to discuss the matter. The student will be provided with at least one day’s notice of the meeting. If no Counsellor that speaks the student’s language is available, the student will be provided with the option of arranging for an interlocutor to attend. The student and any student-appointed interlocutor will meet with the Counsellor and/or the Director to discuss the violation. A final meeting will be arranged. The attendees from the previous meeting will reconvene at the pre-arranged time and date to outline the findings and any resulting sanctions. On completion of the process, documentation including the Student Referral Form, meeting minutes on the findings and sanctions will be kept in the Student File. Withdrawals and cancellations from ESC are subject to the provisions of the ESC Refund Policy. Attendance requirements for individual Focus Programs and UCTP are clearly defined in the Student Course Outlines, which every student receives upon commencement of the course. Should a student fail to meet said requirements, they will be dismissed from that program and return to General ESL Classes. Dismissals from the UCTP Program related to Academic Honesty are dealt with in Student Guidelines: Academic Good Standing: Faculty Member Handling of an Alleged Violation. Dismissals from ESC are dealt with in Student Guidelines: Student Rights and Responsibilities: Violations of Student Code of Conduct.